Walking, as with all physical activity, is incredibly beneficial for the whole body. Its effects are far-reaching and can be seen not only in an improvement in physical health, but also emotional, psychological and social health. If you want to find out more about how walking can benefit you, call the practice now on (08) 61508785 Scarborough or (08) 61508783 Mount Pleasant to arrange an appointment. Your Scarborough chiropractor, Dr Adam Rocchi, is here to help you on the road to good health. Exercise has been shown to have incredible impacts on mental health and happiness. It releases endorphins and other happy hormones that make you feel great. If you are outdoors you also will get vitamin D, which is essential for healthy bodies. Plus, if you walk with family or friends it can be incredibly social and be enjoyable in a social sense too. Walking is a great way to make your jeans fit a little looser. It is a great way to burn calories and get that metabolism pumping. Also, as we get older, it is an important form of exercise to make sure we maintain muscle strength. This will help us stay healthy as we age and decrease our risk of falls and fractures. Walking lowers your blood sugar levels which decreases your risk for diabetes and other cardiovascular diseases. It is a great way to also lower blood pressure, which is associated with a number of disorders including diabetes, stroke, atherosclerosis and certain types of cancers. Somewhat paradoxically, regular exercise actually improves energy levels. 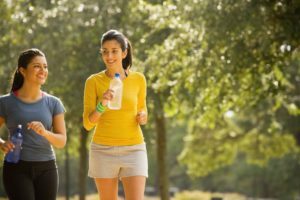 Although it may be fatiguing during the activity, and you may experience a bit of soreness the following day or two depending on how intensive your walk is, overall, you will begin to notice an increase in energy levels. This is partially also due to the fact that exercise improves your sleep quality. So not only will you be sleeping better at night, you will also be more alert and able to concentrate better during the day to do the things you love. It’s something that’s a little bit awkward to talk about, but if you start walking you may notice that you start going to the toilet more often and more regularly. For some of us, this means you won’t have to rely on your morning coffee to get you to go. This can lower your risk of colorectal cancer and other gastrointestinal disorders. Call the practice now on (08) 61508785 Scarborough or (08) 61508783 Mount Pleasant to arrange an appointment and get yourself back on track to better health and a better you.